MDA said it is offering $17.50 in cash and nearly one third of an MDA share per share of DigitalGlobe, for a combined value of $35 per DigitalGlobe share. That deal values DigitalGlobe at $2.4 billion, plus the assumption of $1.2 billion in DigitalGlobe debt. The boards of both companies have approved the deal, which they expect to close in the second half of this year. “Following a thorough review of strategic alternatives, we believe that joining forces with MDA will enable us to deliver more value to our customers, expand opportunities for our team members and maximize value for shareowners,” Jeffrey Tarr, president and chief executive of DigitalGlobe, said in a statement about the acquisition. DigitalGlobe will retain its name and Colorado headquarters. It will operate as a subsidiary of SSL MDA Holdings, a U.S.-based operating company that MDA, based in Canada, established in 2016. That holding company, which includes satellite manufacturer Space Systems Loral, is part of MDA’s “U.S. Access Plan” to create an American entity that makes it eligible for U.S. government work. As part of the plan, MDA plans to file to trade its shares on the New York Stock Exchange, in addition to the Toronto Stock Exchange, where its shares are currently listed. A “further reorganization” of the company is planned by the end of 2019, according to the MDA statement announcing the deal, so that the parent company of DigitalGlobe is a U.S.-based entity. DigitalGlobe was founded in 1992 as WorldView Imaging Corp., after the passage of the Land Remote Sensing Act that year allowed private companies to enter the commercial Earth imaging business. The company became EarthWatch in 1995 after a merger with Ball Aerospace’s commercial remote sensing business. The company’s first two satellites failed. EarlyBird, launched in 1997, failed after just a few days in orbit because of a power system problem. QuickBird 1 failed to reach orbit in 2000 because of a launch vehicle failure. Its first functional satellite, known simply as QuickBird, launched in 2001 on a Delta 2. 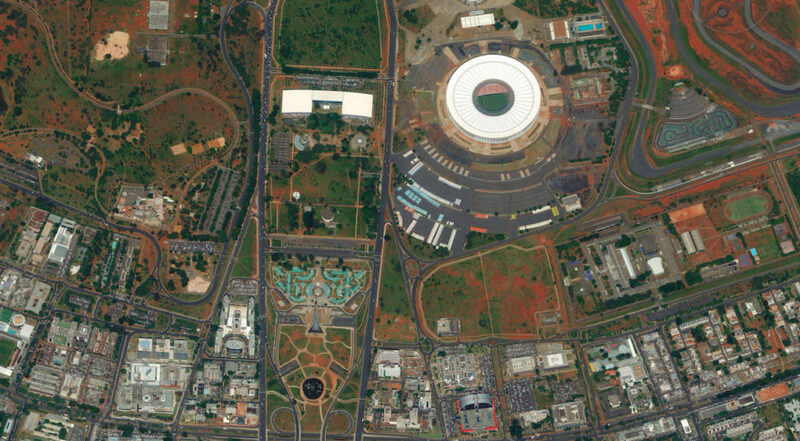 The company, which changed its name to DigitalGlobe in 2001, moved ahead with the WorldView series of spacecraft after winning a NextView contract from the National Geospatial Intelligence Agency in 2004. WorldView-1 launched in 2007 and WorldView-2 launched in 2009. DigitalGlobe merged with GeoEye, another commercial remote sensing company, in a stock and cash deal valued at $900 million in July 2012, months after turning down an unsolicited acquisition offer from GeoEye. That merger was spurred by NGA’s plans to reduce spending on imagery purchase programs that constituted a significant part of each company’s business. The deal closed in early 2013. Two additional WorldView satellites have since been launched, including WorldView-4 — originally built as GeoEye-2 — in November. While DigitalGlobe specialized in high-resolution imagery, with resolutions as sharp as 30 centimeters, the company has faced competition in recent years from a wave of companies developing constellations of small imaging satellites. While those satellites do not provide the same spatial resolution as DigitalGlobe’s satellite, they offer medium-resolution imagery updated on a daily or even more frequent basis. To counter that development, DigitalGlobe announced a partnership in February 2016 with Taqnia, a Saudi Arabian technology development company, and the King Abdulaziz City for Science and Technology (KACST) to develop a constellation of at least six imaging smallsats. KACST will build and launch the satellites and, with Taqnia, market half the imagery capacity of the satellites in the Middle East. DigitalGlobe will have rights to the other half of the imaging capacity in the region and all imagery in the rest of the world. Those satellites, scheduled for launch in late 2018 or early 2019, will produce images with a resolution of 80 centimeters. That makes them comparable to the SkySat series of satellites operated by Terra Bella, the Google-owned imaging company that Planet, another imaging company, announced Feb. 3 it was acquiring. The SkySat series of spacecraft are built by SSL, owned by MDA.